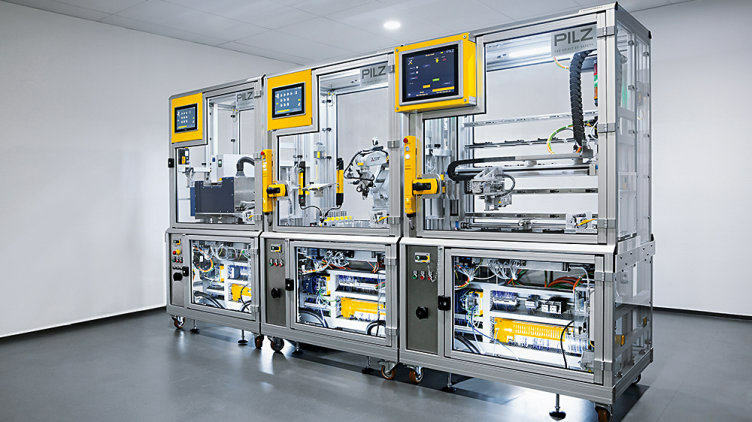 For individual and adaptable production processes in accordance with Industrie 4.0 Pilz offers modular automation solutions. With the Automation system PSS 4000 you program your plant quickly and efficiently as a high degree of standardisation is possible. Benefit from a lower engineering effort and a consistent distribution of control functions! The web-based visualisation software PASvisu will provide you with a comprehensive overview of your automation system. The activated E-STOP pushbutton PITestop active signalise by the illumination that they have been switched to active or passive. PITestop active is therefore suitable for modular plants and machines where parts are temporarily decommissioned or required in a different compilation. With the diagnostic solution Safety Device Diagnostics you retrieve comprehensive diagnostic data over distance and so you reduce your service calls. The Safety Device Diagnostics package is easy to expand, thus supporting a modular machine design. In conjunction with the control systems from Pilz, which support the modular plant construction, you implement flexible safety concepts with all solutions in times of Industrie 4.0. Take a look at our Smart Factory on the Hannover Messe from 24. bis 28. April 2017! Visit us in Hall 9, Stand D17.